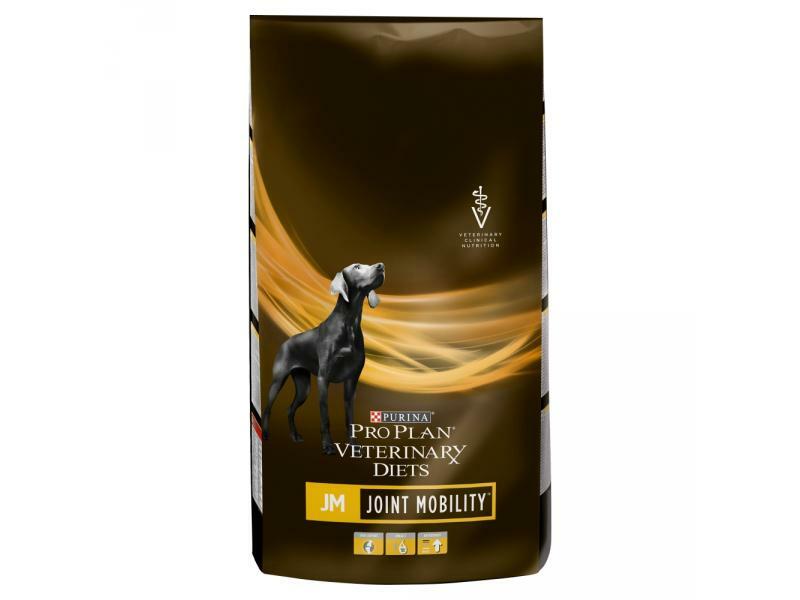 PURINA® PROPLAN® VETERINARY DIETS Canine JM Joint Mobility is a complete pet food to promote healthy joints in dogs of all ages, including puppies. PPVD JM is specially formulated with increased levels of omega-3 fatty acids, including EPA and DHA, to help support the natural anti-inflammatory processes in the joints. This has been shown to improve gait in dogs with decreased joint mobility, thus improving mobility and quality of life. PPVD JM also contains natural sources of glucosamine and chondroitin, the building blocks for cartilage. PPVD Canine JM can be used as a weight loss diet, and its higher protein and moderate fat levels help achieve and maintain a lean body condition, which helps reduce stress on your dog's joints and has been shown to help improve mobility. Note that PPVD JM is not suitable for dogs in kidney failure. Joint support: natural sources of glucosamine and chondroitin to help support healthy joints and help improve gait in dogs with reduced joint mobility. Enhanced antioxidants (vitamins C and E) to help neutralise free radicals produced in joints due to oxidative stress. Omega-3 fatty acids to help support the natural anti-inflammatory process in the joints. Rice flour, dehydrated salmon protein, wheat flour, dehydrated poultry protein, maize gluten meal, dried egg, maize, digest, fish oil, pea fibre, animal fat, minerals. There are currently no questions for Purina Pro Plan Veterinary Diets Canine JM Joint Mobility - be the first to ask one!